In 2000, Krystyna Pieczulis continued her winning ways with her third victory and a time of 2:45:32. The men’s winner was Uli Steidl of Germany with a time of 2:18:53. Uli Steidl returned to win the 30th anniversary running in a close win ahead of Kenyan, Charles Subano with a time of 2:18:56. Krystyna Pieczulis realized defeat in her attempt at four wins in a row when unknown Leteyesus Berhe from Ethiopia arrived to take victory with a time of 2:45:51. Krystyna finished second with a 2:46:04. 2002 proved that strange things can happen. The weather brought rain, sun, wind and hail, but didn’t stop Uli Steidl from a triple victory and a new course record of 2:17:01. Angela Strange became the first Canadian woman to win in 12 years with a time of 2:45:46. 2003 Uli Steidl completes his record fourth win with a time of 2:20:22. Angela Strange was no stranger to victory as she completed her second consecutive win of the VIM with a time of 2:46:22. 2004 is when the VIM became the Uli Steidl Marathon. Steidl went on to win his amazing 5th consecutive VIM marathon with a time of 2:18:24. US runner, Mary Akor, finished her first victory in the VIM with a time of 2:44:43. 2005 saw several new faces take the crown. Uli Steidl’s 5-year incredible winning streak dissolved when Ethiopian Kassahun Kabiso crossed the finish line in 2:15:40, shaving off almost two minutes to make a new course record. Another first time VIM participant, Rima Dubovik from Ukraine, came in at 2:44:05 ahead of last year’s winner Mary Akor to wear the women’s crown. VIM also hosted its first world record. 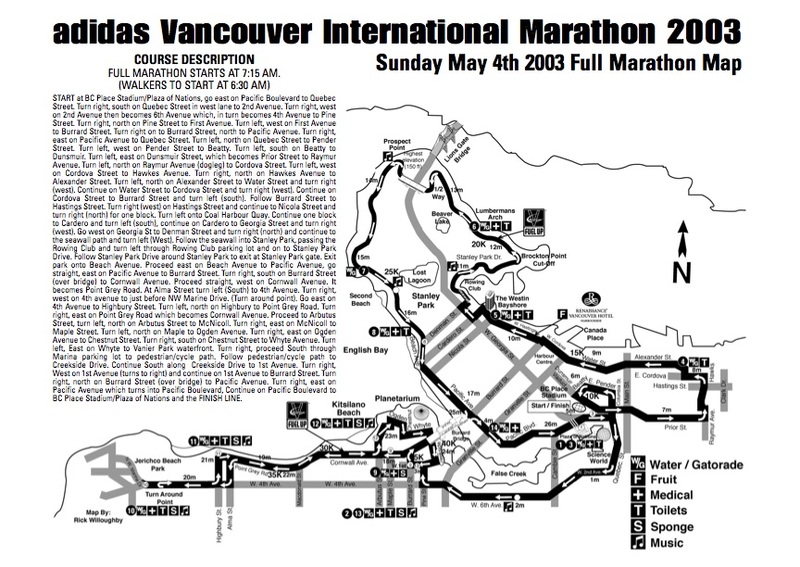 Betty Jean McHugh of North Vancouver ran a 4:10:46 full marathon, establishing the record for females aged 75 to 79. 2006 made history when a women, Malgorzata Sobanska, from Poland, placed in the top 10 overall. Her time was 2:37:06 to place her 1st in the women’s Marathon division. 2006 also saw Kassahun Kabiso repeat his 2005 win with a finish time of 2:18:29. 2007 saw Claudia Camargo of Argentina break the VIMS women’s record with a time of 2:35:50, and the fastest time to date. She placed an amazing third overall, another BMO Vancouver Marathon record. The men’s event was won by Thomas Omwenga, from Kenya, with a time of 2:25:23, defeating two-time male champion, from 2005 to 2006, Kassahun Kabiso, who placed second this year. 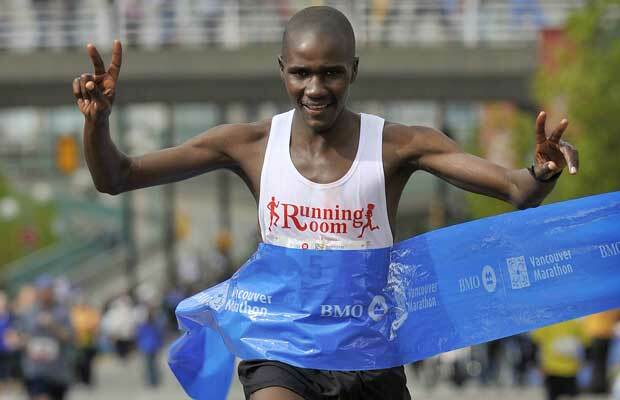 2008 was another dominating performance by the humble Thomas Omwenga in the BMO Vancouver Marathon. Thomas ran to a stunning time of 2:15:59, one of the fastest times ever recorded in Vancouver. On the women’s side, Mary Akor took first place in a time of 2:37:54. 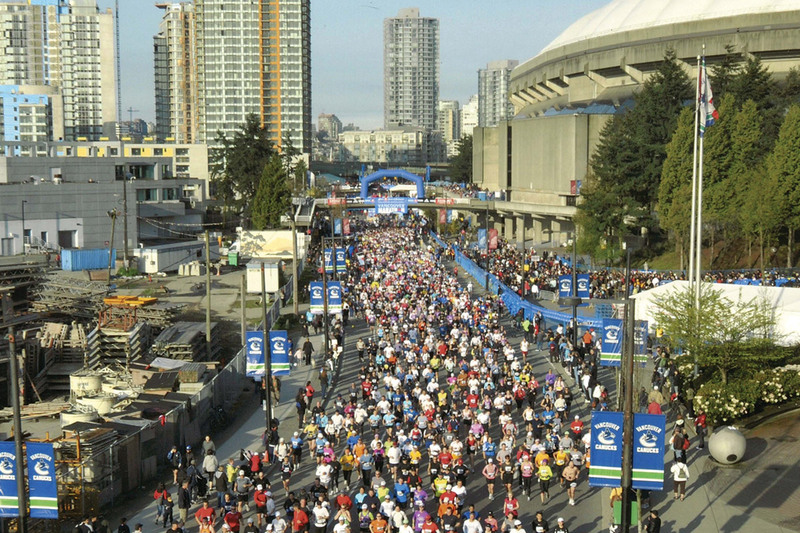 2009 brought great weather and fast conditions to the BMO Vancouver Marathon. Bernard Onsare from Kenya (living in Calgary) ran a very strategic race taking the win in 2:28:26. It was Bernard’s first Vancouver victory. Mary Akor returned to Vancouver to take her third BMO Vancouver Marathon title. She had run with the best in Boston only three weeks prior but had enough in the tank to take the victory in 2:46:24.